This is a sponsored post written by me on behalf of Hormel Foods, LLC for IZEA. All opinions are 100% mine. 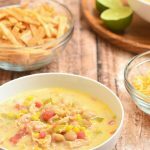 Fiesta Chicken Chili is quick, easy and perfect for busy weeknight dinners. 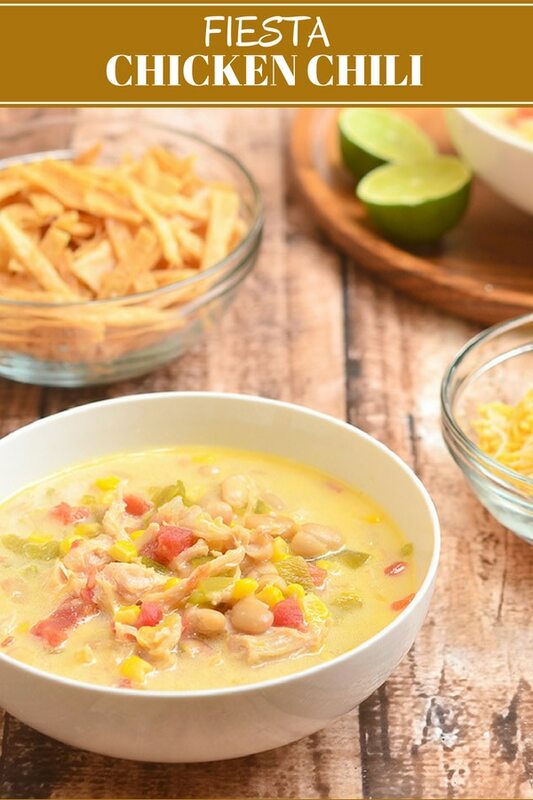 Chock full of chicken, beans, corn, tomatoes, and green chiles in a rich, creamy broth, it’s hearty and tasty! 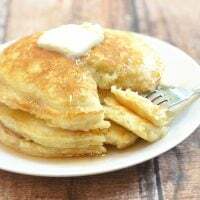 You know how it is when you come home after a long day’s labor all tapped out and the last thing you want to worry about is how to appease hungry mouths (yours included)? It was crazy at work today and I spent the whole nine to five dealing with both minute and crucial issues nonstop. By the time I reached our front door, I was dead tired of body and mind. All I wanted was to tuck myself in bed but I was also famished and needed a quick bite before I hit the sheets. And, of course, G’s first question as I walked in was, “What’s for dinner?” Bye bye, anticipated hot bath and early sleep. Good thing I did my grocery shopping the afternoon before, our pantry is still well-stocked with all sorts of convenient foods. 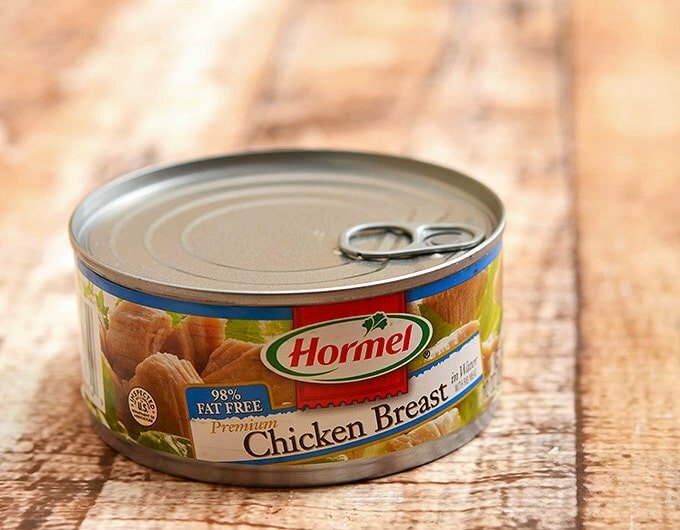 Kudos, self, for having the foresight to pick up half a dozen cans of HORMEL® Premium Chicken Breast! It took less than 30 minutes to have this fiesta chicken chili piping hot on the dinner table and I was well-fed, showered and comfy in my pajamas before I knew it. 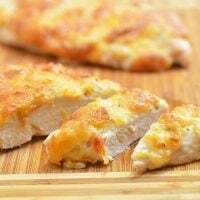 I love HORMEL® Premium Chicken Breast for quick weeknight dinners. 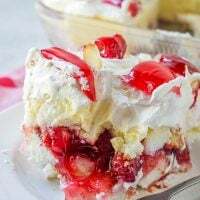 I like how they can be easily made into a simple dinner for two or a potluck item for a crowd. 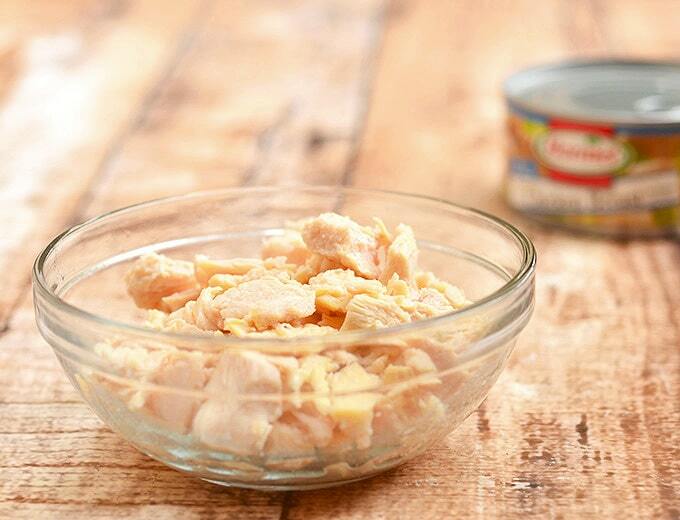 The premium chicken chunks are not only an easy way to add great-tasting, satisfying protein to your meals, they are also super adaptable. You can throw them on veggie salads, toss with pasta, stuff in quesadillas, use in sandwiches, make into this Fiesta chili, and basically any recipe that calls for cooked shredded chicken. 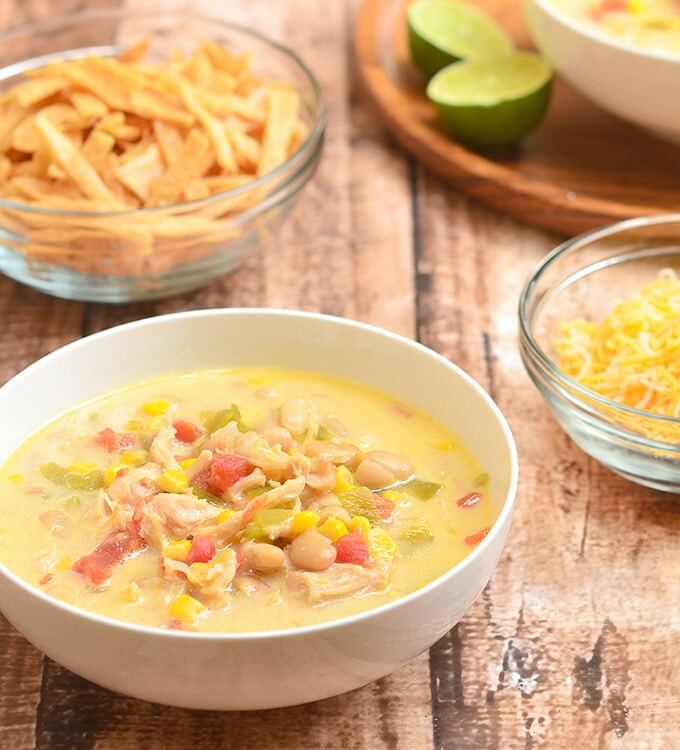 Give this Fiesta chicken chili a try for dinner tonight. 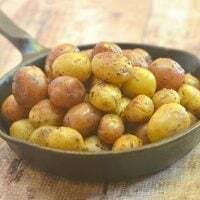 It’s ready in minutes and cooks in one pot! Loaded with beans, chilies, cheese, and crisp corn tortillas, it’s hearty and tasty! Make sure to check out Hormel Foods for more delicious ideas! 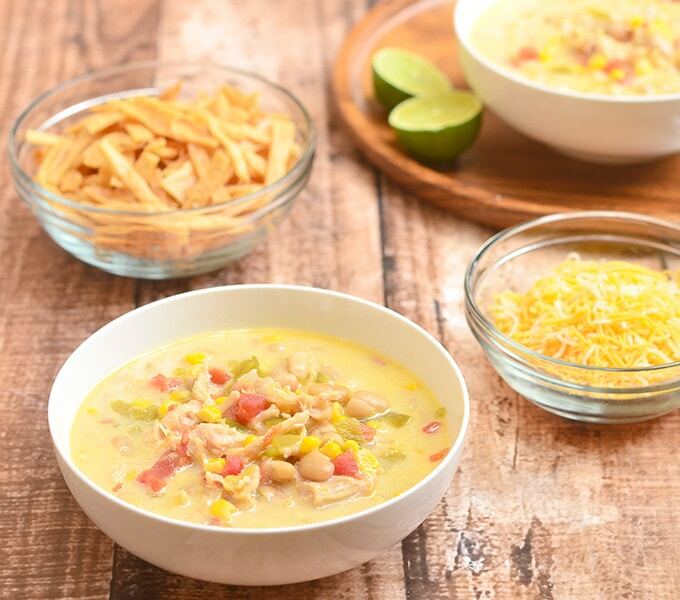 Fiesta Chicken Chili is quick, easy and perfect for busy weeknight dinners. 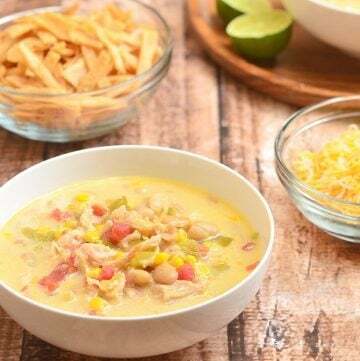 Chock full of chicken, beans, corn, tomatoes, and green chiles in a rich, creamy broth, it's hearty and tasty! In a pan over medium heat, heat oil to 350 F. Add tortilla chips and deep-fry until golden brown and crisp. With a slotted spoon, remove from pan and drain on paper towels. In a pot over medium heat, combine chicken, white beans, corn, diced tomatoes and chilies, diced green chiles, chicken broth. Ladle into bowls and top with tortilla strips. Serve hot.